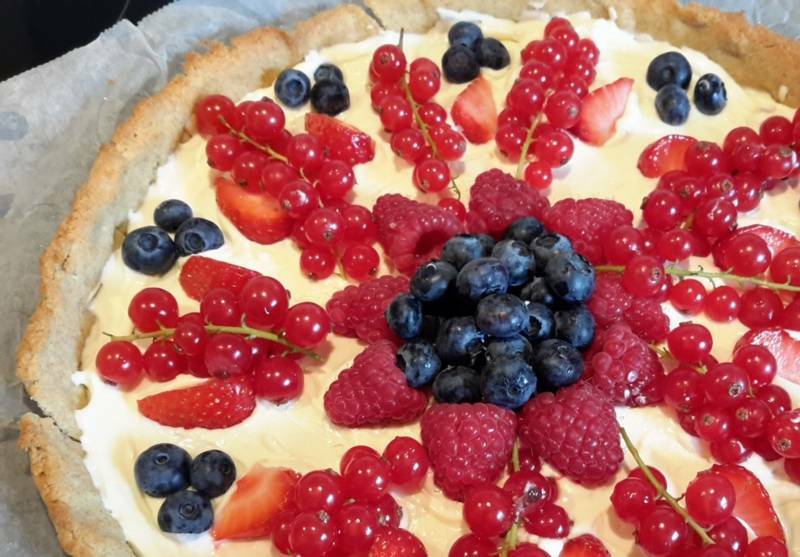 A delicious recipe for a low-carbohydrate fruit tart with Greek yoghurt, in which Greensweet liquid stevia and extra sweet are processed. In March I got the message that I had diabetes. After the first fright I decided to do everything to heal ... It turns out to be possible .. In my case, that meant eating low-carb food, moving every day, but also eating fruit with a low glycemic value. My efforts proved to lead quickly to results. What can nutrition and exercise do a lot! In August I was allowed to stop all medication again. Proud that I was ... and by the way, too. The values ​​are still fine and now it is December. Meanwhile I was much wiser. Many Internet searches have taught me that most products with stevia contain only a low percentage of stevia. I thought that was too artificial. Fortunately, I discovered Greensweet stevia. A pure nature product. I use this stevia with pleasure but also in moderation because I do not like much sweet anymore. But it is wonderful ... that this sweetener is there. Before Christmas I decided to experiment so that I could serve a delicious cake that suits everyone. And it worked. The whole family was very enthusiastic ... I'm sure I make this cake more often. The cake is deliciously fresh in taste and therefore also fits perfectly with a summer festive atmosphere ..
Preheat the oven to 175 degrees (160 degrees hot air). Grease a shape or put a sheet of wetted and squeezed parchment paper in your quiche or spring form, which forms easily and then you can easily lift the bottom. Mix all the ingredients for the crust floor thoroughly and spread the dough evenly over the mold. Also make a raised edge around if you want. Prick holes in the crust with a fork at regular intervals to prevent blowing. Bake the cake bottom in 10-20 minutes until done and golden yellow does not let it burn or really brown that is very unhealthy. The exact time depends on how thick you make the crust and the heat of your oven. Remove the mold from the oven and allow the crust to cool for at least 10 minutes in the mold. Beat the whipped cream and mix the Greek yogurt (or curd cheese). Add the lemon juice. Add to taste stevia X-tra sweet. Wash the strawberries and puree them with a hand blender or food processor. Add the coconut. Then make a mixture of the (washed) blueberries and the walnuts and puree them. When you like a sweet cake, add a little Stevia X-tra sweet to both mixtures. Make the gelatine according to the description on the packaging. Add two teaspoons of the gelatine to both the mixture of the blueberries and the strawberries. Add the rest of the gelatine to the mix of the whipped cream and Greek yogurt. Spoon half of the yoghurt cream mixture onto the cake base and spread evenly. Then take the mixture of the blueberries and the walnuts. This should be neatly spread over the yogurt spoon by spoon. Then add the rest of the yoghurt / whipped cream mixture and then divide the strawberry-coconut mixture over the cake. Let the cake stiffen in the refrigerator for 2 hours. Garnishing is done before serving with almond shavings or as you wish with fresh fruit. Enjoy this deliciously fresh low-carbohydrate cake!